Gearbox is asking the community for suggestions about awesome collectors edition bonuses for Borderlands 2. Let's all say it: most collectors editions are a bit weak. Art books, bonus discs, and soundtracks are hit or miss, and a lot of collectibles are gimmicky at best. The developers of Borderlands are asking you to help break this cycle. "Hey guys! We would love to hear from you all on what you would like to see in a Borderlands 2 Collectors Edition. Let us know! Leave your comments/suggestions below. We know you guys would have some of the most creative ideas - So we want to hear them. Thanks!" 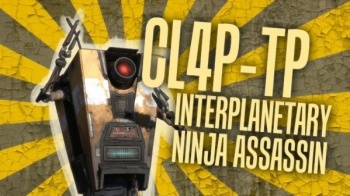 I'd personally love to see a claptrap figurine. Non-lethal please. Check out a few suggestions from the community. Don't like them? Sign up and contribute your own ideas. One thing I think might be cool is a book with "The most coveted guns on Pandora", with maybe 20 of the very rarest and best guns (BL2 equivalent of the double anarchy, defiler, aries, serpens, hellfire, ogre, etc. ), along with lengthy explanations about their parts, what makes them great, and where to find them. Sure, all that information will be available online soon after the game is released, but I'd still enjoy looking through it when the game is first released and reading any personal touches the developers can add. The perfect collectors edition for me would be as follows.